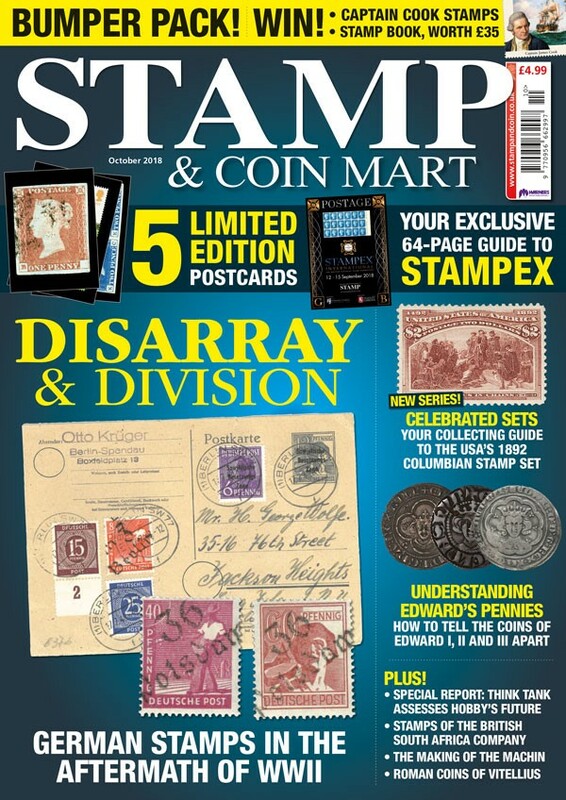 The October issue of Stamp & Coin Mart includes five limited edition stamp postcards and the official 64-page guide to Stampex, making the issue a bumper pack that’s set to be hugely popular with collectors. There’s a huge range of collecting advice, tips, and opinion inside the October issue. In our brand new 'Celebrated Sets’ series we provide an in-depth collecting guide to the USA’s 1892 Columbian set, one of the most ambitious stamp sets of the period. Discover the background of the set and how you can add the stamps to your collection. Our GB offering includes a guide to the making of famous Machin design, including a look at the plaster casts used for the design, now held at The Postal Museum in London. We take a look at the new Captain Cook stamps from Royal Mail, and our ongoing series charting the story of GB stamps looks at the notable stamps of the 1970s and 1980s. Our popular thematics guides the time provide an insight into collecting island stamps, whilst we also cover orchestras, explorers and the Statue of Liberty themes. Our fascinating insight into German stamps in the aftermath of WWII,describes how the country was split up after 1945 and how the postal system was affected, giving collectors an insight into this intriguing subject. In our coin section we help readers understand the pennies of EdwardI, II and II, giving tips on how to tell the different monarchs coins apart, plus the latest coin news, auction updates and advice.